By now, if you are a regular reader of this blog, you know that I welcome disagreements. The creation of this blog from my wife’s imagination, shares no connection with this idea that I want others to blindly agree with my perspective. If you are new to my side of the blogosphere, although I embrace disagreements, I dislike irrational arguments. I do not believe our emotions are particularly good drivers, in this vehicle of communication. They are great passengers, but horrible drivers. By no means am I saying you should be emotionless. Instead, in the midst of a disagreement with someone, tuck those emotions behind your ability to rationalize, and logically express your point of view. Children act first and may think later. However, as an adult, you should not behave in this manner. Where am I going with this idea? Doxing or dox, which is an abbreviation for documents, is the Internet-based practice of researching and broadcasting personally identifiable information about an individual. The methods at one’s disposal includes searching publicly available databases and social media websites (think Facebook), hacking, and social engineering. When you disagree with someone online, the disagreement should end there. Person A: Video games promote violence against women, and increase criminal behavior in society. Person B: I cannot follow your reasoning that video games promote violence, when I understand perfectly that art is an imitation of life, as opposed to life imitating art. More importantly, the victims in video games are disproportionately male by a severely wide margin. This focus on females is misleading at best, and a blatant lie at worst. With over 33 million copies sold of a popular video game and life being an imitation of art, crime by your logic would increase, and represent actions depicted in video games. However, that is a complete fallacy. Person A: (searches for their employee records and home address. Sends out Tweet with this information, after contacting their employer and complaining about harassment, which leads to Person-B losing their employment). The people who behave in this manner, are some of the worst kinds of humans, whether offline or online. Person-A allowed an online disagreement to spill offline, all because they were mentally incapable of using critical thinking to state their position. How is it the fault of Person-B, because you are overly sensitive and irrational? You should instead confront your parents and psychologist with these issues. Without providing the individual’s name, a female blogger had her information released and employer contacted recently, by what seems to be other female bloggers. Her employer then asked for her resignation. Did this individual make death threats online? Nope! Did this person perhaps make a racist comment? Nope! What did she do to warrant doxing? She simply disagreed with the popular opinion of online provocateurs, and the provocateurs did what they do best—react irrationally. We are setting a clear precedent and this pattern says lunatics can feel whatever they want, and hold society hostage under these privileged feelings. Bravo…bravo. You prove yet again, why I believe lunatics are taking over the asylum. In an economy where I do not believe in intentionally causing someone to lose their livelihood, I believe it takes a special kind of person to dox, with the goal of having someone lose their source(s) of income. Offline etiquette is not much different from the etiquette you must have online. Whenever you practice this horrible action of doxing someone because they disagree with your opinion, it speaks volumes about the individual you are offline. To the woman who suffered financially at the hands of these lunatics, I genuinely hope that you find employment soon. It is awful that your livelihood has to suffer, all because of provocateurs. I do not know you personally, but I sincerely hope that you bounce back with an even higher paying position. It is one thing to lose your job because of poor performance. It is another when a vile creature online, decides to contact your employer for unwarranted reasons. A number of people in this current era of social media are mindless, overly sensitive, ill-equipped in their reasoning and immature. These are horrible traits for young minds to learn, and with more teenagers using websites like Twitter, this bad behavior may soon become normal behavior. The culture that you continue perpetuating, I want no part of it. This is my perspective on doxing; I would like to read yours. Do you consider doxing an appropriate action to take, solely because someone disagrees with an opinion? Do you think each website should become more stern, against users who dox? Doxing is an especially nasty form of bullying and those who engage in it are complete rubbish. Women can be especially vicious, contacting employers, the cops, the family court system, often completely making stuff up. They do this to men and to other women too. I’ve doxed my own self on the internet a couple of times, simply because this form of bullying ticks me off so much. People who make such threats might as well drop that rope because I am not playing that game. Good day IB. I hope you have been well, over the past few days as you and the family welcomed 2015. I hope this message reaches you in the best of spirits. 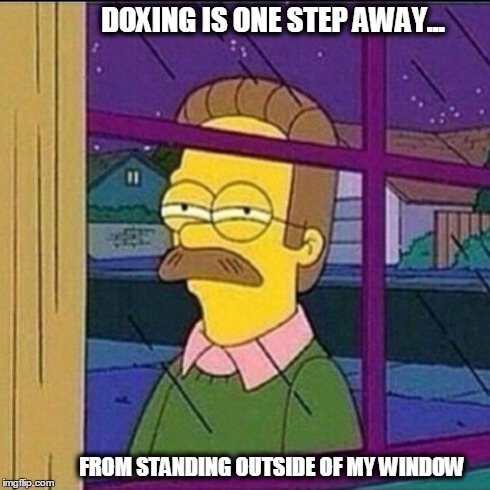 When I read your post on doxing several months ago, I was ignorant to the prevalence of the practice. Lately, social media has taught me just how sick some people can be when they disagree with your opinion. I can definitely see it being a form of bullying, especially now that I am more aware of its prevalence. It saddens me to think people actually take pride in doxing. They use it as a tool to silence opposing perspectives, and here I am with my silly beliefs, where I believe agreeing to disagree should end one’s discussion. I guess these doxers showed me. LoL. In all seriousness, it is quite a disturbing practice on the Internet, which I fear may possibly become normalized. It’s nothing more than a form of terrorism, instilling fear in the many by taking out the one. As always, terror tactics are the last refuge of the weak. A jealous woman, who we later learned is actually a man, tried some cyber terror on me by copy pasting what she viewed as “firtatious comments” to a man she considered “her property”. She tried to scare me by sharing those with my family on Facebook. Her/His first mistake was that my family & I have no secrets, they read my blogs & have my email passwords etc. Her/His second mistake is that my kids are techies and he/she used their own Facebook account / email to try to take me down which made it very simple to trace. In the end he/she only managed to anger my kids. They handled it with all the grace and tact one would expect of skilled techies after you have dissed their mother in a public forum. LOL lets just say ummm it backfired slightly. I don’t have secrets that are put online that those I care about don’t already know and that kinda keeps things simple for me and mine. I also don’t like to deal with drama or cyber wars so I avoid when I can. Which is why I keep a lower profile here. I left the site I used to blog at because of too much drama and a temptation on my part to publish the personal info my kids gathered on the harpies there. I have no desire to sink to their level. I walk away unless I can’t. When I can’t I take a step or two forward and smash it in the face. Online, it’s easy to “walk” away. Thank you for this response. I hope you are having a wonderful continuation during your journey through 2015. I was unaware just how silly some people online can become, when you disagree with their opinion. Doxing is definitely taking things too far. I definitely see it as a way to trigger fear. I also agree that terror or trying to strike fear, is usually a defense mechanism. Interesting that I didn’t see this with doxing, until you pointed it out. Thank you. You children did something that I would’ve. You mess with our mum, and you will surely feel the wrath. No need to do anything but use your wits and talents, which is what your children did. Bravo to them. People simply choose the wrong individuals to attack, and your family of techies, well, that was surely a wrong avenue to venture. LoL. There’s something that I’m beginning to notice from observation lately. These people thrive off drama and cyber wars. In fact, they salivate at the mere sight, as if it were a meal prepared by a world renowned chef. It’s rather sickening really, and with doxing, there are real world consequences. I personally believe there should be consequences imposed on those who dox others online. I don’t know what type of consequence yet, but it will come to me. I totally agree with you on this one. Many of us have to choose to be anonymous online for this very reason. Until I read your post, I had never heard of the word ‘doxing’. To me it’s just another form of harassment or cyber bullying. In the UK recent changes in the law have given online users a little protection but still not enough. My own experience made me realise that the internet can be a very dangerous weapon especially in the hands of someone who, for reasons best known to themselves, want to destroy your life. I am also a great believer in the freedom of speech. However, this freedom has been taken away from us by the threat of the very ones you describe. It seems it’s fine for them to be able exercise the right to free speech as long as nobody disagrees with their opinion. I am in the process of applying to have any information about me that is accessible online removed from all search engines. I am not having my life destroyed again that’s for sure! Thank you much for checking out this post. I think everyone can relate to her story, because in all seriousness, it can happen to anyone. That’s the tragedy with doxing. Some people are so immature online, the platform gives them the ability to act out their immaturity. Doxing someone solely because you disagree with their opinion is a horrible action. I now understand why people prefer to have anonymous blogs. Some people are simply insane online. I actually heard about doxing from fellow blogger InsanityBytes (the first commenter on this blog post), due to a post she uploaded several months ago. I then watched a video regarding the woman in this story, doxed by others online. I had to write about doxing after that. The UK’s “right to be forgotten” ruling is an interesting ruling, because I agree with it, until I hear about these stories where vicious criminals (murderers/rapists) are using it to their advantage. The issue with doxing is that it is very much legal still. There’s so much gray area and I am completely open to freedom of speech. However, contacting my employer because you disagree with my opinion to file complaints, that’s something else entirely. You are 100 percent correct, which is why I write about the current changes in culture, due to provocateurs online being given power for their moronic beliefs. Giving a platform like the Internet to immature and irrational people, is like giving a gun to a known mass murderer. You have hit the bullseye. I agree one billion percent. They love freedom of speech, until the moment you express your speech, which disagrees with their rhetoric. That’s not quite freedom is it. LoL. I wish you all the best scrubbing the net, because having your life destroyed once, is once too many. I totally agree with this. When I read about what happened to that poor woman, it just made me sick. We should not let these despicable actions be tolerated. I hope this message finds your day going well. Happy New Year’s to you and your family. Thank you for taking a moment out of your day, and spending some of it on this post. I appreciate your time. When I first heard about her situation, I was utterly disgusted. To think people take pride in this idea that, “I made someone lose their job,” is truly sickening. Sadly, we (collectively) give these provocateurs the platform to act out their immaturity. We cannot allow this behavior to become the norm. There are real consequences to this horrible behavior of doxing, simply because you do not like me opposing your opinion. It’s as if these provocateurs are dictators of the Internet. Very true, but it is very hard to stop this behavior. Because most of the times, it is already too late and the damage is already done. The question is not if we must stop this behavior, but how? How do we stop it, when the consequences are only felt by the ones who lose their job? Because often, the doxer is unharmed. That is where I am unaware of what consequences should be imposed, or how one could go about upholding these consequences. However, there are specific changes taking place online, in the form of harassment. Sadly, I think they’ve muddied the waters on what is harassment and what is simply an opposing point of view. This has caused me to question these rulings regarding harassment as well. For instance, a real user sending out repeated death threats is a clear case of harassment. However, if you send out a nonsensical tweet and someone points out the fallacies on your position, I would not deem such a response harassment. However, both of these are classified as harassment. That is problematic in my opinion. You are correct nonetheless, in regard to the doxer going unharmed. Happy new year, OG. Work has been insane lately and I am just catching up with a backlog of your posts. It’s like Christmas revisited having so many to read all at once. I am aware of the practice but had never heard the term “doxing” until reading this. The other commenter have stated my thoughts so much more eloquently and with dean-on accurate terms to describe it. With all the attention being paid to bullying one would think more consequences would be triggered when this type of thing happens. Shouting down, beating down dissent from others is becoming normal, accepted behavior and civil discourse less and less common in this country and it is truly frightening. I wonder what sort of world the youngest generation will mature into, where discussion between two disagreeing parties is reduced to a battle of discrediting each other versus talking to each other and analyzing the facts of the matter. I am starting to wonder if there will even be facts, or if facts will be reduced to the perspectives of the loudest, most cunning among us. Good day. I genuinely hope your entrance into the new year has been well. We are doing splendidly. I was honestly unaware of the label as well, until InsanityBytes (the first commenter) wrote a post several months ago, describing the action. Bullying is one thing, but you hit it perfectly–beating down dissent from others is becoming normal. They are now chalking up anything and everything to mean bullying, even when you may logically call into question an incredibly misleading idea. Person-A is now equipped under the “hurt feelings” law (sarcasm) to classify that response as bullying, though it simply calls into question the validity of the initial claim. I’ve seen this time and time again. I project in 20 years, facts and logic will become outlawed. HaHa. In all seriousness, it may not be outlawed, but you see it now. When people speak the truth with tact of course, they have to later recant and apologize under pressure, lose their jobs, etc. It is a tragic time indeed.